The Cardinals-Rockies rivalry, known for its high-scoring games, began, improbably, with a shutout. The Rockies, a National League expansion team, faced the Cardinals for the first time on April 20, 1993, at St. Louis. The Cardinals won, 5-0, on a combined shutout by Rene Arocha and Omar Olivares. There was a strong Cardinals connection to the first Rockies team that faced St. Louis. Don Baylor, the Rockies’ manager, had been the hitting coach on manager Joe Torre’s staff with the 1992 Cardinals. 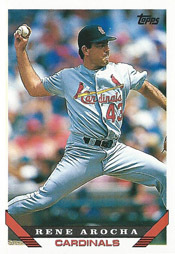 Rockies first baseman Andres Galarraga and starting pitcher Bryn Smith had played for the 1992 Cardinals. Center fielder Alex Cole had been in the Cardinals’ minor-league system. Galarraga, who broke his wrist in the Cardinals’ second game in 1992 and finished with a .243 batting average and 39 RBI, signed with the Rockies as a free agent. He entered the Rockies’ first game against the Cardinals with a .422 batting mark and 14 RBI after 11 games. On a chilly Tuesday night before 30,516 at Busch Stadium, the Cardinals scored three in the first and two in the fourth against Smith. The win was the only one Arocha earned against the Rockies in four big-league seasons. The Cardinals won seven of 12 games against the expansion Rockies.